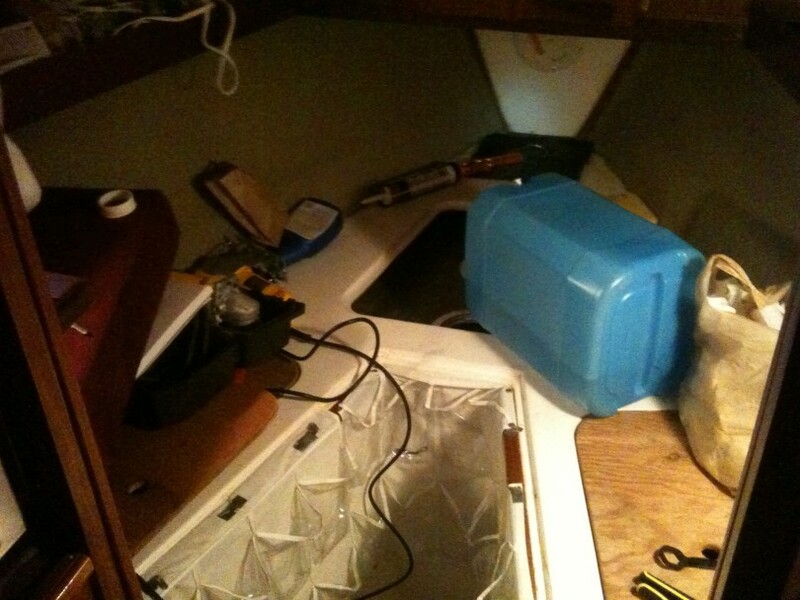 The fresh water on the boat is stored in a 48gallon tank under the v-berth. This runs through reinforced hose along the starboard side of the boat under the cabin couches, behind the counter in the head, through a bulkhead to the starboard lazarette. In the lazarette is a Jabsco water pump that is then split to the cold water hoses, and the hot water tank. All of these hoses are then distributed to the galley sink and the head sink. The problem I was having is that when I would open the faucet, the water pressure was so poor, it would take a few minutes to just fill a pot of water. There is either a blockage in the pipe, failure of the pump, or air leaks somewhere along the joints. After months of replacing almost every component along the way, it turns out it was a little bit of everything! The first thing I did was replace the reinforced hose from the water tank to the Jabsco Par Pump. This was a relatively inexpensive upgrade and I felt good that the water wasn’t running through nasty old hose. Unfortunately it did not solve the water pressure problems at all and I lost a good day or two laying the hose down in the most hard to reach places. The next thing I replaced was the water pump. I ran over to West Marine and picked up a brand new water pump that was recommended for a boat my size and number of sinks. I was tempted to get a stronger pump to guarantee to fix the water pressure problem but lack of funds kept me in check. The other potential problem would be wasting a larger amount of water every time I turn on the tap. Filling up the water tanks is not a fun job, and even less so in the middle of the winter. Unfortunately.. after this expensive replacement, I realized the old pump was actually working just fine and I still had the same water pressure problems. What a waste of time and money. At least I have a spare water pump now I suppose. What was frustrating was that for a few months the water pressure seemed to get a bit better so for a time I believed I had actually fixed the problem. I was wrong. After months of frustration, hearing the pump struggling to pressurize, and only seeing a trickle of water out of the tap, I finally decided to finally solve this once and for all. The pump works when drawing water from a jug, so there must be something wrong in the tank. I figured there must be a problem with the water tank. There were no inspection ports on this water tank so there was no way to see what was wrong in there. I ran to home depot and found an inexpensive auger to shove into the pipe where the water is supposed to come out. At first it didn’t want to fit in the small pipe after wrestling with it for an hour or two and busting up my knuckles, I cut the end of the auger tip off. Actually I couldn’t cut it off since it was strong metal but I did manage to painstakingly file it off (after running back to home depot for a file.) I managed to get the auger into the pipe but it didn’t really resolve anything. I had to get into that tank and see what was going on. I bought two Beckson ports at the local Marine Store (Mason’s Chandlery), some GE Silicone 2, and an expensive DeWalt Jig Saw at Home Depot. (Yay new tools!). I removed my bed mattress, foam, and duvet from the vberth and got to work cutting 2 6inch holes along the top of the aluminum water tank so I could take a look inside. This would let me also clean inside the water tank which I was guessing pretty scummy after 30 years. I was also told from a neighbor that if I wanted to travel abroad, it is necessary to have inspection ports to let the local Port Authorities to look inside. I started by marking where I wanted the ports installed. I could see a ridge on the tank which I guessed was from the baffles welded inside to slow the sloshing water around while underway. I made sure the ports were well clear of it. I drilled a hole to start with a good drill bit a few places around the perimeter and then got to work with the jigsaw cutting out the circular hole. This proved to be more difficult than I thought. I just could not fit the jigsaw in certain angles as it was too near the edge of the fiberglass sides. Those areas were slowly cut out by hand with hand saws and more drilled holes. It was time consuming, awkward to reach, and could have been a lot easier if I had planned a bit better in positioning the ports. AHA! Once I had cut in, I could see the problem immediately. A gross plastic back had somehow gotten into the tank and sucked up partially into the bottom of the intake pipe. Judging by the color of the plastic, it had been floating in the tank perhaps the day the tank was built. It looked like it a bag used to carry screws or something. I excitedly filled the tank up a bit and tried the tap again. The water pressure was… better… but still didn’t work. What the hell was going on. I finished installing the Beckson Inspection Ports by sealing it with silicone and fastening it with nuts/screws. I should point out that after drilling into the tank there was a fair bit of aluminum dust in the tank. I spent a good deal of time cleaning and flushing the tank out. But that gave me an idea.. perhaps the Aluminum dust had clogged the faucet. I didn’t find metal dust shavings after all. I think it was too heavy to be sucked up into the system and instead just gathered along the bottom of the water tank, but the faucet had been gummed up with sand particles. So after that cleanup everything was finally working. The water pressure was better than I had ever seen it. 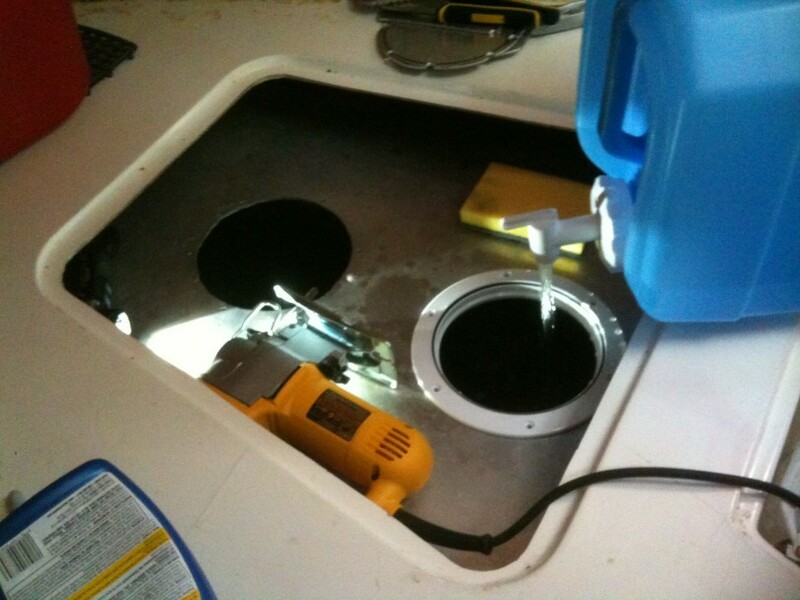 I am still a bit paranoid about getting any aluminum dust shavings into my water so I went one step further and installed a water filter under the galley sink. It was the only place I could find to fit this rather large filter. I am still using a basic filter to clean large particles out but will eventually replace the filter with an active charcoal filter once I am certain the tank has been flushed a few times. I also filled the water tank with a tank cleaning chemical and scrubbed the calcium deposits off the sides. Overall the water tank looks in great shape but I may at some point in the future coat the inside with epoxy to give the tank another 30 years of life.